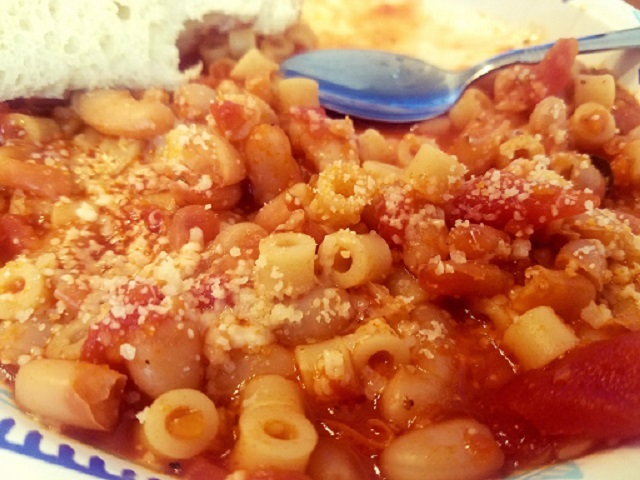 One of the first recipes I ever learned to make is Pasta Fagioli. It’s on heavy rotation at my house (especially during those colder months) because we all love it so much! 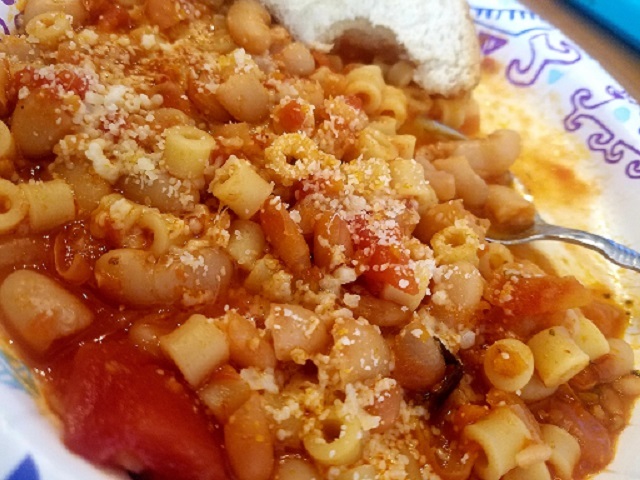 It has incredible flavor and it’s jam-packed with a garlic tomato sauce, making it more like a bean and pasta stew than a soup. Every Region in Italy makes it a little different. I have had many versions, by far this is our favorite in flavor. Italian classic recipes like this one were considered depression food by my grandma and family. Back in the 1960s when money was tight, we ate this very often. It would feed many people including, family, friends and the neighborhood kids on the block. We always had a huge pot of this on the stove. I still make this pasta fagioli often and think of my mom and grandmother, precious memories were made. Recipes for pasta e fagioli vary, the only true requirement being that beans and pasta are included. Great Northern beans or borlotti beans and a small variety of pasta such as elbow macaroni or ditalini. The base typically includes olive oil, garlic, minced onion, celery, carrots and often stewed tomatoes or tomato paste. Some variations omit tomatoes and instead use a broth base. Preparation may be vegetarian or contain meat (often bacon or pancetta) or a meat-based stock. 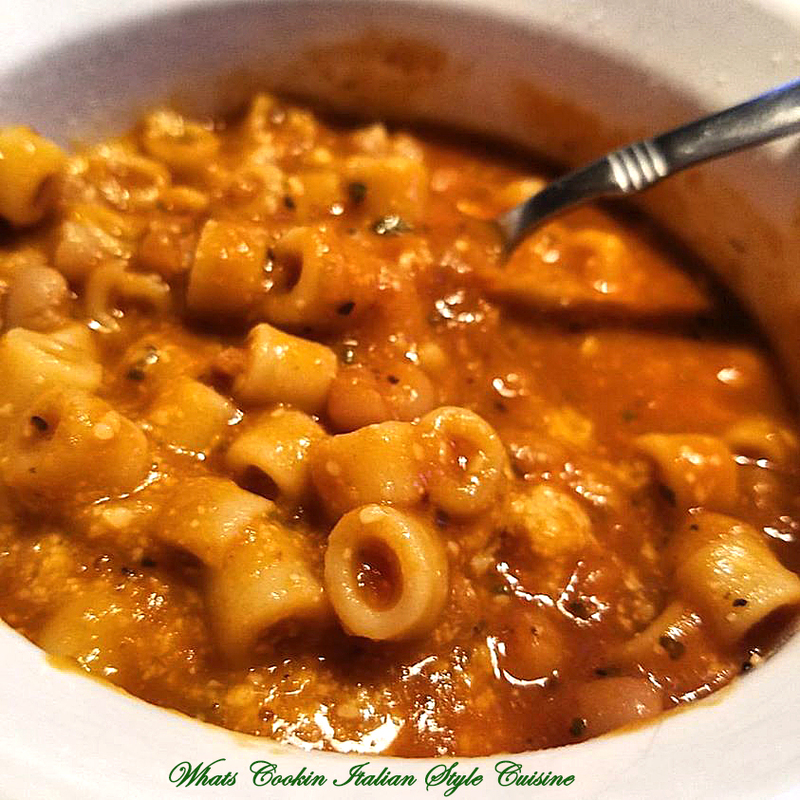 Pasta e fagioli, or pasta and beans, is a classic dish found in most Italian households. Like many of the dishes that are now popular around the world, this was once a peasant dish in Italy. A very simple dish that is both high in fiber and filling! The two ingredients however that always remain the same are cooked beans and some sort of short pasta. If using fresh plum tomatoes, I pulse them in a food processor for just a few seconds. All the vegetables I use go into the processor first to pulse fine. Then I add the tomatoes to be chunky. I like the garlic, carrots and celery hearts finely minced. I like my vegetable in taste when it comes to those ingredients, but the tomatoes stay chunky. If you like that idea, then do the other vegetables in the food processor before adding the tomatoes. I love also using fresh tomatoes to make fresh marinara sauce, another classic favorite for pasta. Growing up my grandma and mom always told me this was depression food meaning, it feeds a large family inexpensively. I consider it a gourmet meal and love it. The recipe is over 100 years old. 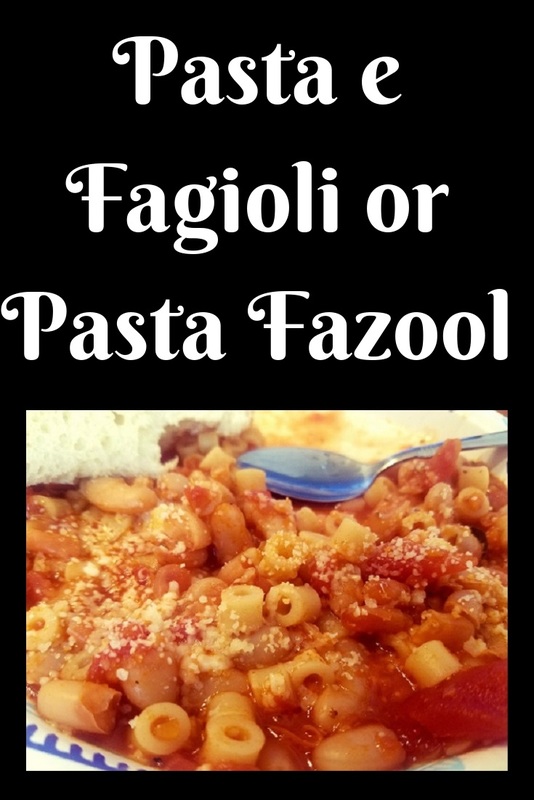 If you have never tried making this Pasta e Fagioli or Pasta Fazool, it's an easy first dish to try that's a classic Italian meal. Just make sure you have a delicious hard-crusted loaf of bread to dip into this fabulous and tasty sauce! There is a recipe card below to print it off or you can just follow the recipe as is. 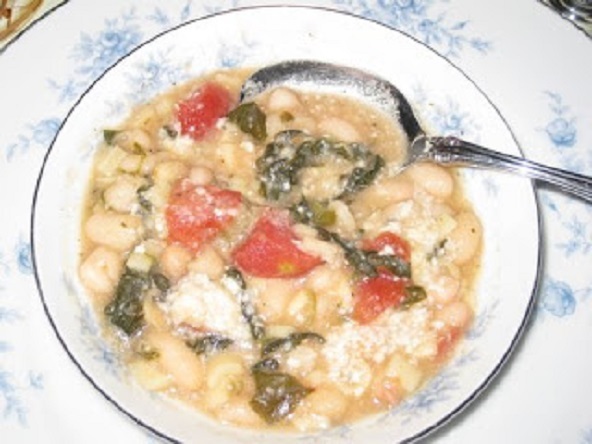 A great soup, or beans and pasta dish. With crusty bread its a winner every time. 1/2 lb. ditalini boiled separately and drained or baby shells, and even orzo will work. One of the first recipes I ever made. Grandma has made this so many ways, thick, with greens, thin as soup, you can use this basic recipe and make it the consistency you like. Grandma made Pasta Fazool with Chicken Soup broth and fresh tomatoes no paste and only whole tomatoes. You can make either version they are delicious. Chop the celery finely. Saute fresh garlic with tomato paste in enough olive oil to cover the bottom of medium pot till golden and fragrant. Remove garlic when starting to brown (do not burn). Drain beans and add to pot. Add herbs, wine and spices add chopped escarole. Add celery, finely chopped carrots if using, broth and tomatoes. Cover and let simmer on medium heat for approximately ½ hour. In a 2 quart pot, boil water for ditalini to package instructions and drain. Add ½ cup grated cheese to the beans to thicken it add more broth if too thick ( I also love red pepper flakes which are optional for a little heat). Stir in cooked pasta. Serve with garlic bread and red pepper flakes on top and grated Romano cheese. Optional: Grate more Romano cheese on top pasta Fagioli when serving. Nice addition to this dish, is cheesy parmesan garlic bread, or just plain crusty Italian bread. I double this recipe. You can adapt any way you like. Watch my Quick Video Clip on Pasta Fazool! I've never had this dish before, it sounds so delicious! I love your family recipes! This would be a lovely meatless meal as the weather grows cooler!